Allergic reactions are the immune system's way of dealing with exposure to an irritant. Allergic reactions are very common and can range in severity from a rash to life-threatening anaphylaxis. Rashes associated with allergic reactions most often occur when your skin comes in contact with a substance to which you are allergic. According to the National Institutes of Health, or NIH, allergic reactions tend to get worse with repeated exposure and are more common in people who have a family history of allergies. Clearing up an allergic reaction rash is not difficult, but it is essential to avoid the source of the allergen in the future when possible. Identify the source of the allergen, if possible. If the source of the allergen is a bee sting, carefully remove the bee stinger with tweezers. If the source of allergy is exposure to detergent or soap, washing hands with a different soap or changing clothes may help. According to the NIH, the most common allergens are animal dander, bee stings, food, medications, plants and pollens. Apply cool compresses to the areas of skin affected by the rash. Watch the patient for other signs of distress. 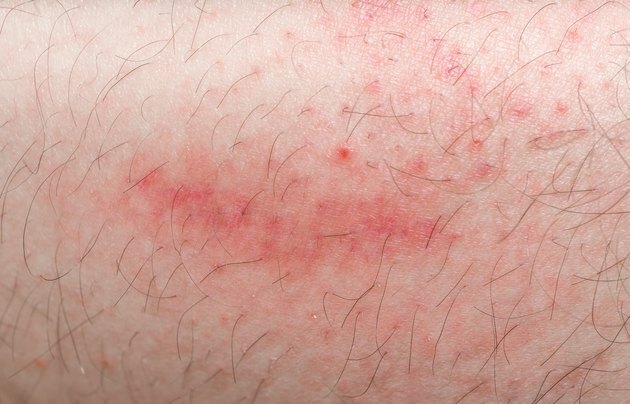 The drug company Merck states that skin rashes may also accompany other common signs of allergy, such as runny nose, watery eyes and even breathing difficulties in severe cases. However, Merck states that most cases of allergy will resolve on their own when you remove exposure to the allergen. Apply hydrocortisone cream to the affected areas and allow to dry. Hydrocortisone is a mild steroid cream that reduces the inflammation and discomfort that can occur in response to allergies. If this does not relieve itching or allergy symptoms, give the patient diphenhydramine, an over-the-counter allergy medication. If the patient is having difficulty breathing, seek medical attention immediately. This could indicate a possible life-threatening reaction. If allergic reactions or rashes recur frequently despite attempts to minimize exposure, or do not resolve with the above treatment, see your doctor. Your symptoms may have a different cause.